A study by the University of Maryland of Amazon deforestation in the Brazilian state of Mato Grosso shows that direct conversion of forest to cropland in the state totaled over 2,000 sq. miles (540,000 hectares) during 2001-2004, peaking in 2003 at 23% of all deforestation for that year. According to the researchers, the findings signal a shift in deforestation from the historic uses of cattle ranching and small-plot farming toward large-scale agriculture. Published this week in the online edition of the Proceedings of the National Academy of Sciences*, the study found that clearings for cropland averaged twice the size of clearings for pasture and conversion occurred rapidly with more than 90% of clearings for cropland planted in the first year following deforestation. Over the four year study period, deforestation for large-scale cropland accounted for 17 percent of forest loss in large clearings. However, area deforested for cropland and the mean annual soybean price in the year of forest clearing were directly correlated, suggesting that deforestation rates could return to higher levels seen in 2003-2004 with a rebound of crop prices in international markets, the authors say. Fig 1: (Upper) Summary of conversion dynamics by post-clearing land cover for 2001-2004 deforestation events >25 ha in Mato Grosso State, Brazil from satellite-based phenology information in the years following forest clearing. A preliminary estimate of 2005 deforestation estimate is shown in grey (INPE PRODES). Inflation-adjusted prices per 60 kg sack of soybeans for the same period as the annual deforestation increment (September-August) are plotted on the right-hand axis in Brazilian Reais (R$). 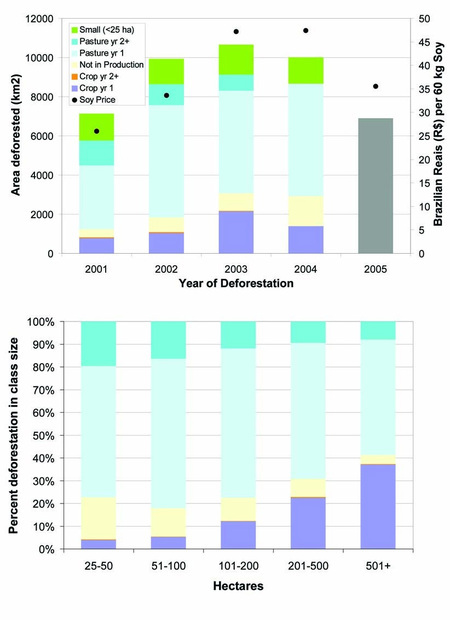 (Lower) Fate of 2003 deforestation events by clearing size. “There has been a lot of debate recently about the role of large-scale agriculture in Amazon deforestation, says University of Maryland geographer Ruth DeFries, who led the study. “This study on one hand refutes the claim that agricultural intensification does not cause new deforestation. On the other hand, it shows that clearing for pasture rather than intensive mechanized agriculture remains the dominant cause of deforestation in the state of Mato Grosso,” DeFries said. 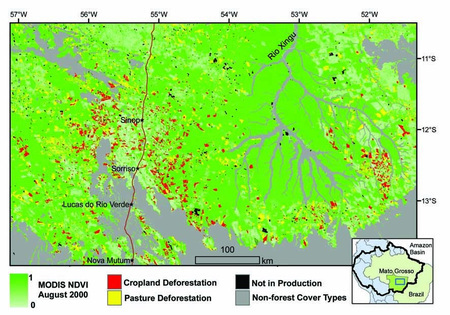 Fig 2: Tropical deforestation for cropland agriculture in Mato Grosso state (2001-2004) is concentrated along the existing agricultural frontier. (Inset) Location of the study area subset within Mato Grosso State and the Amazon Basin. The team combined deforestation maps, field surveys and satellite-based information to see what happened to large plots (greater than 60 acres) of rainforest after they were cleared. Clear areas were characterized as cropland, cattle pasture, or re-growing forest in the years following initial clearing in Mato Grosso, the Brazilian state with the highest rate of both deforestation and soybean production since 2001. More on soy farming in the Amazon region. *“Cropland expansion changes deforestation dynamics in the southern Brazilian Amazon,” by Douglas Morton and Ruth DeFries, University of Maryland; Yosio E. Shimabukuro, Egidio Arai and Ramon Freitas, Instituto Nacional de Pesquisas Espaciais (Brasil); Liana O. Anderson, Instituto Nacional de Pesquisas Espaciais and University of Oxford (England); Fernando del Bon Espirito-Santo, University of New Hampshire; Jeff Morisette, NASA Goddard Space Flight Center. Proceedings of the National Academy of Sciences, (PNAS Online Early Addition, Sept. 5-8, 2006).